Our Heinz First Steps cereals range for breakfast and meals contain key vitamins and minerals tailored to your little one! Perfect for little fingers, our Heinz So Yummy range are made with simple ingredients and are ideal for between meals at home or on the go! Watch author and mum lzzy Judd talk throught her experience weaning two little ones in our Weaning Workshop films. 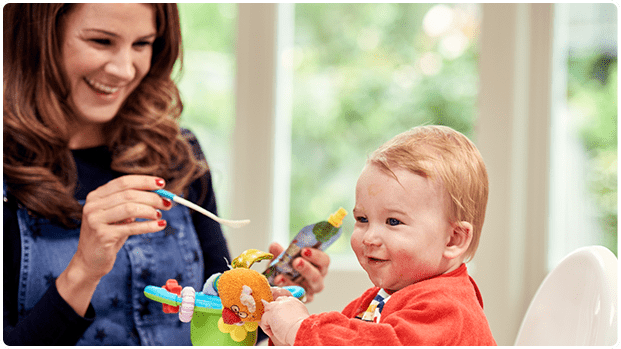 Whether you're about to get started or you've already begun weaning, lzzy has tips and advice to share - from knowing the signs to look out for to managing mealtimes when you're on the go. HOW MUCH MILK DOES A 9 - 12 MONTH BABY NEED DAILY? HOW AND WHEN SHOULD I OFFER FINGER FOODS? MY BABY IS 11 MONTHS. CAN I GIVE HIM BABY FOOD? MY 13 MONTH OLD HAS STARTED CHEWING HIS FOOD THEN SPITTING IT OUT. CAN YOU HELP?